Still better than a low heptane fight. This week Kiyan and Dylan check in a new person to the Companion Hotel: Sarah Jane Smith. She’s booked a long stay, let’s see how it goes. The topic of discussion of this week was The Time Warrior, which was written by Robert Holmes and aired in December of 1973 and January of 1974. Don’t mind me, just gonna prop open the door so Jo can come back. This week Kiyan and Dylan say goodbye to Jo Grant in her final serial, The Green Death. And even in her final moments Dylan and Kiyan remain divided in their opinion of her. Thanks Jo, you were definitely not a scientist. The Green Death was written by Robert Sloman and aired in May and June of 1973. Wait. Did you hear that? It’s telling us that the government knows. This week Kiyan and Dylan stumbled their way through this weeks serial. Did Kiyan mention that he couldn’t think? Well, you know now. The serial covered this week was Frontier in Space, written by Malcolm Hulke and aired in February and March of 1973. In this very special episode (possible pilot for a series?) 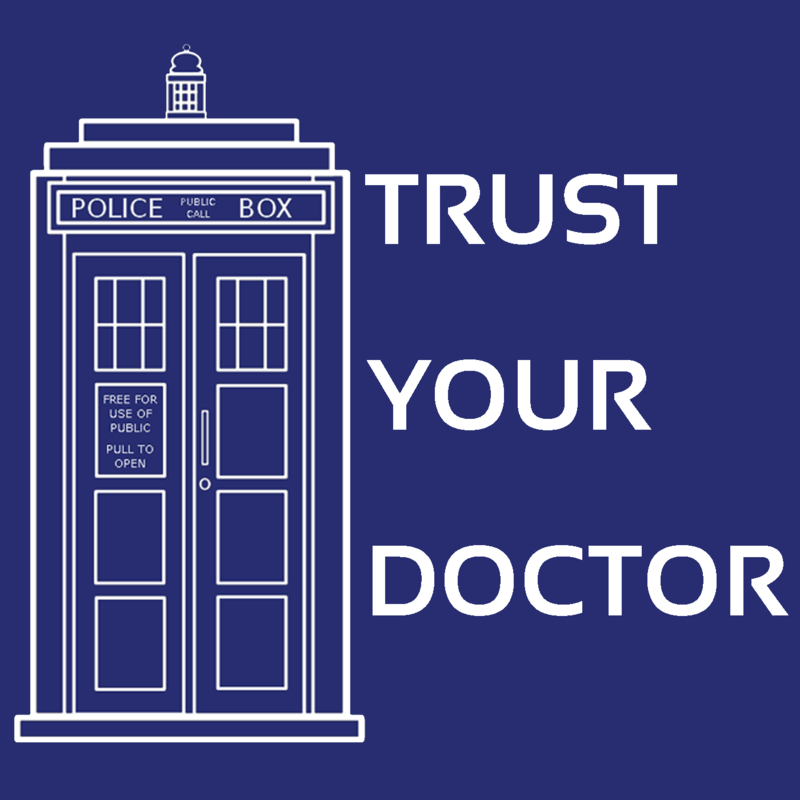 of Trust Your Doctor where we read a book, Kiyan and Dylan are joined by Nathan and Brendan from Flight Through Entirety. So I guess the title is a misnomer since we didn’t get all of Flight Through Entirety on the show. Could you imagine a show with that many people? Well anyway, the quatro attempt to discuss the inner workings and the plot line of Last of the Gaderene, a Third Doctor novel written by Mark Gatiss and originally published in January 2000, later republished in 2013. Last of the Gaderene takes place between Planet of the Daleks and The Green Death. Will there ever be an opportune moment to use that phrase? This week Kiyan and Dylan describe the pretty mediocre serial Carnival of Monsters, which was written by Robert Holmes, a major player in classic who. It aired in January and February of 1973. Be sure to check out Flight Through Entirety at their website (http://www.flightthroughentirety.com) ahead of the coming collaboration episode! Episode 68: The Mark Hamill Level "No"
No, Susan, I am your grandfather! NOOOOOOO! This week Kiyan and Dylan are visited by some very special people… And they’re late, to boot. It’s very weird, but at least it’s somehow related to The Three Doctors, which featured the return of Patrick Troughton and William Hartnell to the role of the Doctor. The serial was written by Bob Baker and David Martin, and it aired from the 30th of December, 1972 through the 20th of January, 1973 as a 10th anniversary special. Interesting dor and taur sound similar but are spelled differently. This week Kiyan and Dylan work towards a new more witty episode…. No totally kidding, they just watched a witty serial. Said witty serial happened to be The Time Monster, written by Robert Sloman (with uncredited additions by Barry Letts), which aired in May and June of 1972. Interesting that dor and taur sound similar but are spelled differently. Kiyan and Dylan, while agreeing the serial is good (although to a different degree), somehow like/dislike this serial in different measures. Find out why, as they explain The Mutants, written by Bob Baker and David Martin and aired in April and May of 1972. Seriously, this show has no effort ever, making it a good idea! This week Kiyan and Dylan finally succeed in integrating all their discussions into the summary of the serial, rather than just shoving it to the end, as usual. Thank goodness for Malcolm Hulke, his amazing penmanship skills, and his serial, The Sea Devils, which aired between the 26th of February and the 1st of April, 1972. Seriously, this show has no hard work ever, making it a good idea! Ambiguity is one of the best/worst/neutral things. In this episode, for the first time in quite a long, long while, Kiyan and Dylan end an episode disagreeing on something. Well actually multiple things over the episode. This, of course, is a product of multiple heated debates over the course of the episode, which should be hopefully enjoyable. Is Jo the worst character in the serial? Or Peladon? That’s for the dear listener to decide. The subject of these debates was The Curse of Peladon, written by Brian Hayles, and aired in January and February of 1972. It’s the Master’s second evolution: The Subliminal Pun Master. This week Kiyan and Dylan explored demons and witchcraft. Or so they thought until 5 minutes into episode 1, where the Doctor just slapped that thought out of their mind, because magic isn’t real. The topic at hand was The Daemons, which was written Guy Leopold and aired in May and June of 1971. This title is actually in no way related to the serial at all. This week Kiyan and Dylan watched Colony in Space. As usual when presented with a mediocre serial, they end up taking a few tangents throughout the whole episode, seemingly with no regard for sticking to explaining the actual serial. Colony in Space was written by Malcolm Hulke and it aired in April and May of 1971. I still can’t accept that that pun was so good. This week Kiyan and Dylan investigate The Claws of Axos. It was written by Bob Baker and David Martin, who would later create the character of K-9. The Claws of Axos aired in March and April of 1971. Episode 59: CHEESE. PASTEURIZE! PASTEURIZE! This week Kiyan and Dylan discover what it means to have The Mind of Evil. The serial was written by Don Houghton and it was aired January through March of 1971. Episode 1 was recoloured entirely by one man, Stuart Humphreys, frame by frame. Episode 57: Too Many Paradoxes! Great Scott! That many paradoxes could destroy the universe! This week Kiyan and Dylan not only finish season 7, but also the tenure of Liz Shaw as de facto companion. They also wander into the alternate universe in Inferno, written by Don Houghton and aired in May and June of 1970. Episode 55: Divergent Species. Line. Thing. Divergence is actually a pretty fun word to say. This week Kiyan and Dylan encounter what is probably the darkest ending so far in Doctor Who and the Silurians. It was written by Malcolm Hulke (co-writer of The War Games) and it aired in January through March of 1970. Episode 53: It's the Time Lords, Messing With Our Brains! Episode 52: History: When Did it Happen? By my calculations, it happened tomorrow. Kiyan and Dylan this week explored the first 5 episodes of Troughton’s swan song, The War Games. It was written by Terrance Dicks and Malcolm Hulke. The first 5 episodes aired between April and May of 1969.